(Hybrid Perpetual) An interesting rose of bright crimson red with white edging to each petal. Fragrant. (Gallica) Striking, pale pink blooms striped with purplish-crimson. These are borne on arching stems amid grey-green foliage. A most distinctive rose and very fragrant. 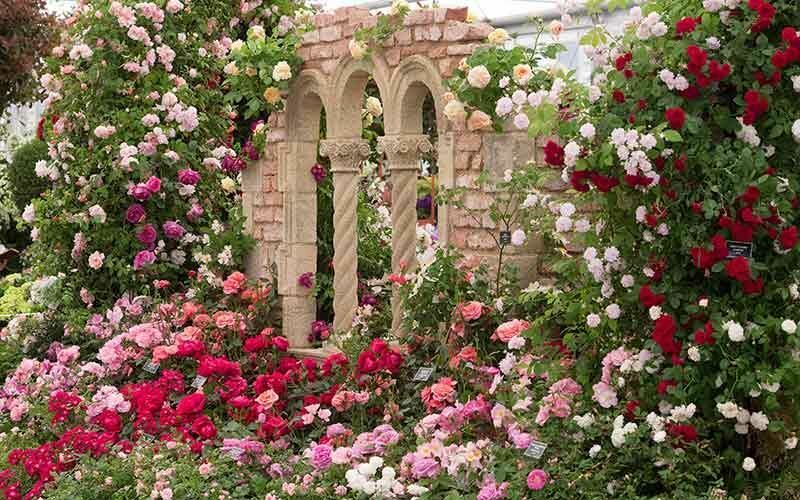 (Ground Covering Rose) Clusters of semi-double, flowers of gold cerise and pink. Glossy foliage. Large yellow tinged pink blooms with splashes of cherry red. Ideal for growing in a pot. Has dark green foliage. Bred by Delbard. Unique to us in the UK. (Tea) An interesting combination of rich colours. Yellow, orange, pink and salmon, sounds vulgar but is actually a very lovely rose with good foliage for a Tea. (Modern Shrub) A very bright rose with clusters of single flowers on an upright plant. The colour is yellow and red, the red intensifying with age. (Bourbon) A strong bush with fresh green leaves. Large double crimson flowers, striped pink and purple and marbled white. An excellent rose. (China) A semi-double, fragrant rose of orange-red. Very free flowering.